The case needs to be made for a backup security order in Europe – guaranteed by Europe, alas without the US, writes Robert Steenland. No week passes by in which US President Donald Trump’s controversial comments – often ventilated through twitter – make headlines. The past weeks have been no exception. However, they have been particularly damaging for Europe’s security order based on NATO and that of the world liberal order, as he linked the trade war against the EU with defence spending. Trump’s latest actions should be a wake-up call to those concerned with Europe’s security. Strangely enough, Trump considers many US traditional allies as opponents, particularly the EU and Germany, whereas he engages with those on the other side. Donald Trump’s escalating rhetoric prompted the other President Donald (Tusk) of the European Council to tweet ‘‘With friends like that, who needs enemies?”. His rather ridiculous statement that NATO members should increase defence spending up to 4% of GDP during the NATO Summit wasn’t the worst. He flirted with the idea of leaving NATO, stating the US could go it alone, and for which he stated he would need no US Congress approval. In a subsequent travel to Helsinki to meet the Russian President, he classified the EU as a ‘‘foe’’ in an interview, whereas he made friends with Putin, whom he trusts to not have interfered in US elections. It did not end there, as he implied in another interview he would not defend Montenegro in case of an attack – which he suggested would mean WW3. Given that Montenegro is NATO’s most recent member and supposedly suffered from a Russia-backed coup d’état in 2016 to prevent it from joining, it proved extra painful. In addition, Russia has been alleged to have been sabotaging the Macedonia-Greece name dispute that could open NATO doors to another Balkan country. 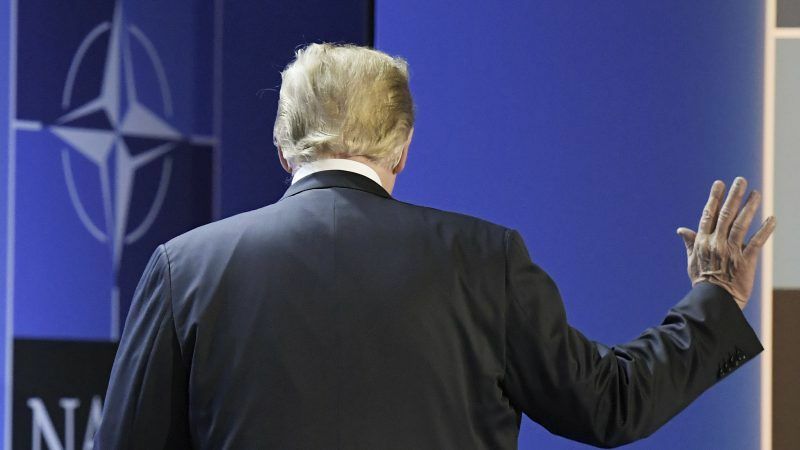 Trump’s ambiguous attitude towards NATO and the liberal world order is not new, as he made clear both during the US presidential election campaign and after being elected he would pursue his ‘‘America First’’ approach. This was shown by the ‘‘obsolete’’ remarks on NATO. He also buried TTIP that could have strengthened US-EU trade ties and unleashed a trade war instead. Not to mention his withdrawal from the Paris Agreement and the Iran Nuclear Deal. The question is how much more needs to happen before Europe realises it might stand vulnerable on its own one day. As the world is becoming ever more multipolar and the global order is shifting rapidly with the West in relative decline and emerging powers such as China on the rise, the case needs to be made for a backup security order in Europe – guaranteed by Europe, alas without the US. The timing could not be more urgent, given the multitude of challenges Europe faces, whether it is migration, instability in North Africa and the Middle East or the direct and hybrid threats from Russia. This means Europe should get its act together, and follow-up on defence cooperation initiatives such as PESCO (Permanent Structured Cooperation) and the European Intervention Initiative (EI2). The latter is particularly important, given that it goes beyond the EU, with the UK on-board. However, more is needed to move towards some kind of European Defence Union, with countries’ militaries integrated, decisions being made jointly and its members unconditionally committing to mutual defence when the situation requires. A clear strategy would need to be agreed on as well, to define Europe’s threats and the ways to deal with them effectively. This also means ‘‘footing the bill’’ as Trump has urged Europe to do, to keeps militaries capable. Defence should be seen in this regard as an insurance, in case of a serious calamity, and without the US to cover our back. This no longer seems impossible in the current era, where Mr Trump could serve another term. Some countries might hold back at first, especially traditional US allies. However, even the UK has realised that betting on security from across the Atlantic might not be its best choice. Others will follow this same logic. While it was France that blew up the European Defence Community in the 1950s, things are different now with President Macron in charge. Public opinion supports more cooperation on defence as well, as shown in the latest Eurobarometer, where 75% of those surveyed support this. Therefore, coalitions of the willing should continue pushing taking the lead to secure Europe’s future security, which could be without the US and NATO. As stated by Donald Tusk in the same Twitter message on Mr Trump: ‘‘Thanks to him we got rid of all illusions. We realise that if you need a helping hand, you will find one at the end of your arm’’. are not compatible. The US spends about 4% of GDP on defence and thats about 70% of the combined NATO nations spend. Without the US the EU would need to spend 4% just to stand still and that ignores the amount of catching up it needs to do in capability. Trump has the numbers right, if the EU wants a serious defence union that will deter nations like Russia then it will have to pay for it. Sorry, but that is not correct. The US also maintains military presence in the pacific….So that 4% of the US includes expenditures that have nothing to do with NATO (remind the ‘Atlantic’ part). I chose my words carefully, I did not say NATO spend but the defence spending of NATO nations. While the US military assests are spread across the globe it is inconceivable it would not use them if needed in a conflict. Russia also has a long pacific coastline. NATO is the organisation that allows the European countries to maintain their armies to defend from, and attack any other European country, while feeling safe from a common enemy through protection by a third party. This whole situation is like some form of mental illness. We must wake up and realise who our real partners are – our neighbouring countries. There are enough armies in Europe to defend ourselves against whatever would threaten us. We must learn how to use them. But who will be in command? Without quick and decisive decision making any defence (or offence) organisation is inept.